When you have your six month checkup and teeth cleaning in Medford, we will recommend additional preventive treatments as needed to help you enjoy a happier, healthier smile for years to come. One of the most valuable preventive tools at our disposal is the topical fluoride treatment. It is especially useful for children, but patients of all ages can benefit from cavity prevention with exposure to re-mineralizing fluoride. Fluoride is a mineral that exists naturally in the ground and in the food we eat. Topical exposure of fluoride to the teeth has been proven to strengthen tooth enamel against cavities. Fluoride provides re-mineralization after the tooth enamel becomes weakened when it comes in contact with the acids and sugars in the foods and beverages you consume. These harmful particles damage the tooth enamel and make it easy for decay to form. Fluoride, applied topically, strengthens the enamel and provides significant protection against cavities. 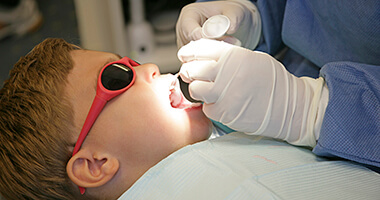 Most children can benefit from fluoride treatments. Their tooth enamel is weaker than an adult’s, and it needs extra help fighting against the sugars and acids that weaken tooth enamel and lead to decay. Adults who are at a higher risk of decay, such as those who are genetically cavity prone or smoke and suffer from dry mouth, also benefit from topical fluoride treatments. Because they are an essential part of preventive dental care, many dental insurance plans will cover annual or biannual fluoride treatments. To apply fluoride, we fill a mouth-sized tray with a gel that contains the mineral. The gel is flavored to help make the experience as pleasant as possible. At the end of your checkup and cleaning, you will wear the tray filled with fluoride for a couple of minutes. Then we remove the tray and you rinse and spit. And that’s it! Topical fluoride applications are fast, efficient, and provide lasting protection against cavities. If you or your child could use more exposure to fluoride in between appointments with your Medford dentist, make sure you and your family brush with a toothpaste that has been approved by the American Dental Association, as fluoride is a prerequisite for approval. Fluoridated mouth rinses can provide an additional boost of exposure. Talk to your dentist about whether or not you need to significantly up the amount of fluoride you receive every day before beginning with a supplement. Some patients can run the risk of overexposure to fluoride. When was the last time you had a fluoride treatment in Medford? Dr. Rosenfeld and our team will recommend one to strengthen your tooth enamel and help you steer clear of cavities. Schedule an appointment today!